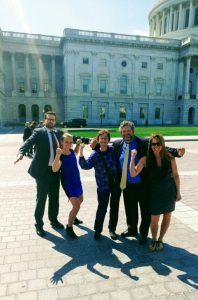 A well-stated theme to this year’s Blue Vision Summit, where dozens of the world’s leading ocean conservation groups joined to not only work together, but to create a huge blue wave over our Nation’s Capitol. The team representing the state of New York. We stood with a Surfrider Army representing states from sea to shining sea of the United States (CA, WA, FL, ME, NC, NJ, NY). We came to urge our nations leaders to support grassroots efforts on the national level. Surfrider was just one within a choir of voices meeting together to discuss the thing we have in common: love and respect for our seas. The Blue Vision Summit was led by extremely acclaimed marine activists who paved the way for the blue movement. We were joined by Dr. Sylvia Earle, a mentor to many, who spoke from her heart and from personal experience that we have reached a critical point and it is our duty to save our seas. We were also met by several governmental agencies including political activist Ralph Nader, and Rhode Island’s Senator Sheldon Whitehouse. We also urged our governments to fully fund the Environmental Protection Agency (EPA), which includes the BEACH Act, providing around $10 million nationwide for water quality monitoring programs on the state level. If left unfunded, many states will therefore be unable to assess if people would get sick from visiting the beach. Also within the EPA is the National Estuary Program which currently strives to protect and restore 28 estuaries in our nation. We also pushed for full funding of the National Oceanic and Atmospheric Association (NOAA), who plays an integral role in not only monitoring our weather systems, but also guides the use and protection of our coastal resources. Many threats face our ocean, but this has given rise to armies of coastal defenders. And this weekend, the capitol heard from them. We understand the health implications of wastewater pollution, the abundance of plastic marine debris, and the way offshore drilling threatens every inch of coastline. We understand that our economies and our human health depend heavily on our waterways. And, we understand that if we want change bad enough, we have to stand up and fight back. After speaking to many driven individuals and representatives of our congress, we are optimistic to find that we have so many members on our team. We learned that our voices do matter. Never hesitate to contact your representative’s office and speak out about what you care about.